CAMERA’s Israel office has prompted a correction on an article in the Sept. 23 English print edition of Ha’aretz which had wrongly reported that Israel allowed concrete and steel to enter the Gaza Strip legally for the first time in six years. 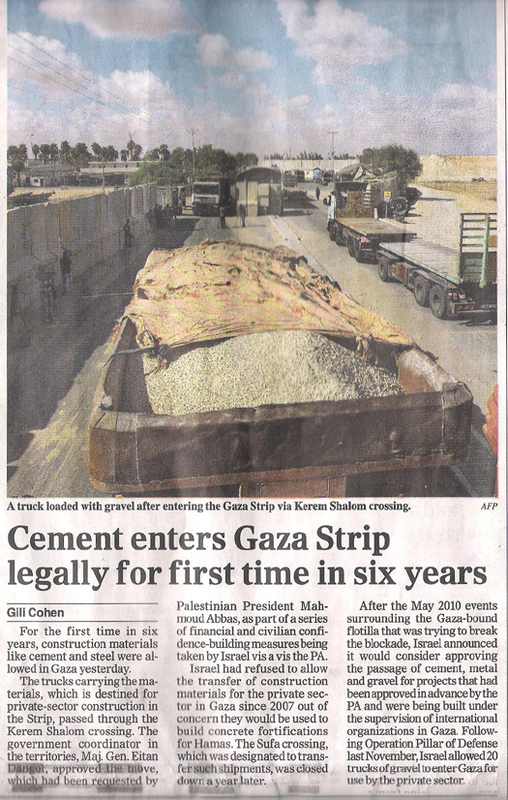 In short, contrary to the headline and first paragraph of Gili Cohen’s story, both cement and steel were previously allowed to enter the Gaza Strip in the last six years.This month’s news was that cement and steel were permitted for the first time for the private sector, whereas previously cement and steel were permitted only for projects undertaken by international aid organizations. CAMERA has withdrawn its Press Council complaint. For previous Ha’aretz corrections prompted by CAMERA, please see here. Other media outlets which, following communication with CAMERA, earlier this year corrected misinformation about the import of construction materials to the Gaza Strip include the Associated Press (in September and in January), National Public Radio, The International Herald Tribune and The Los Angeles Times. To see the Hebrew version of this post, please visit Presspectiva.